Let’s Raise A Glass To The Humble Goblet Cell! 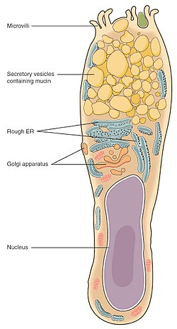 Goblet cells are modified epithelial cells that are found in mucous membranes throughout the body, including the intestinal, respiratory tract and the eye. Goblet cells are so named because of their shape – resembling a drinking vessel. They contain mucin which, when released from the cell helps form mucous which coats the mucous membranes to trap particulate matter such as dust and smoke but can also trap bacteria and viruses. In the eye, they line the surface of the conjunctiva where they also help stabilise the tear film as well as their traditional functions. Goblet cell loss in the eye results in an unstable tear film and subsequent dry eye symptoms. It is seen in several ocular surface diseases, including Sjögren’s syndrome, Stevens-Johnson syndrome, and even graft-versus-host-disease where a lack of a stable tear film may lead to ulceration and rejection. Goblet cells may be damaged by trauma and the resultant reduction in Goblet Cell Density (GCD) is associated with dry eye symptoms. Some glaucoma drops, have also been associated with a reduction in GCD, as has the use of the bright lights of operating microscopes during cataract surgery and the application of the suction ring in laser surgery, all of which result in dry eye symptoms following those procedures. Numerous studies have demonstrated that contact lens wear can also affect GCD. One study (Carracedo et al, 2016.) looked at the effect of orthokeratology on two groups. One group were previously wearing silicone hydrogel lenses and the other group were non-wearers. The silicone hydrogel wearers showed a significant increase in GCD and a reduction in dry eye symptoms after one month of ortho-k wear. (The baseline measurements were significantly lower for this group than for the non-wearers). The conclusion was that ortho-k may be a viable alternative for silicone hydrogel wearers with dry eye symptoms. Another study (Luis H. Colorado et al, May 2016.) looked at daily disposable hydrogel lens wearers over a six month period and compared them with a control group who did not wear lenses over the period. This study showed that GCD was reduced in the contact lens wearers compared with non-wearers. Some of the contact lens wearers reported dry eye symptoms, and this group showed a 29% reduction in GCD, the other group of wearers had no symptoms, but still showed 13% reduction of GCD. Whilst the measurement of Goblet Cell Density is not a procedure that can be undertaken in the practice environment, in the research field it may offer an objective measure of the possible trauma induced by contact lens wear of different fittings and/or materials. The example quoted above showed that switching to an ortho-k lens from a silicone hydrogel lens resulted in a reduction of symptoms and an increase in GCD over just a month of wear. It would be interesting to see whether going from a moulded lens in a fixed diameter/base curve to a customised lens produced a measurable increase in GCD. Similar lenses in different materials might be objectively compared to give the practitioner an idea of what materials are best suited for the marginal dry eye patient.